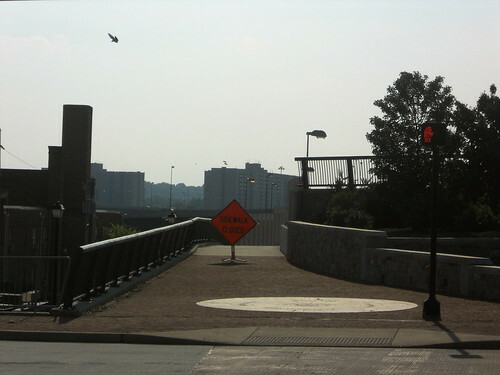 Wilson Bridge Trail Expansion Joints to be Inspected. It is the best of trails, it is the worst of trails. The Wilson Bridge Trail offers beautiful views, scenic rest areas with historic and educational markers. It provides a bike and pedestrian connection where previously there had not been one. It is enough of an attraction that many people walk it just to enjoy walking it. When they reach the end, they simply turn around. For cyclists, however, there is a problem. Expansion joints, about ten of them, jolt cyclists at regular intervals over the length of the one mile bridge. Each has a gap of several inches where the trail surface drops by about 3 inches. The expansion joints extend across the entire width of the bridge, but have a different configuration in the motorized traffic lanes. Motorists, unlike cyclists, get a smooth ride. In 2013, I wrote to the Maryland-National Capital Park and Planning Commission, which maintains the trail, to thank them for plowing snow from the trail in winter and to ask about the expansion joints. I was told that upgrades to the bridge, if any, would come from the Maryland State Highway Administration. I recently followed up with the SHA and in an e-mail reply I was told that “in the past we have filled bridge joints with rubber seals that help prevent bike tires from falling into them. Perhaps this might help ease the bumps. The maintenance crew may also have other ideas.” In a follow-up phone call on Tuesday of this week, I was told that the expansion joints would be inspected within the next two weeks. On my own daily commute, the Wilson Bridge expansion joints have damaged bicycle components and cargo. Front and rear lights, a cargo basket, a water bottle, and a laptop computer are among the casualties. I've replaced components and learned to pack more carefully (tip: sensitive electronics go on the rider, not the bike). However, after replacing several headlight mounts that snapped off in very cold weather, when the plastic becomes brittle, I now attach my front light to my bicycle only after I cross the bridge, even at night. This is hardly an ideal solution and is tolerable only because the trail has lighting. The expansion joints pack much less of a punch at speeds above 20 mph, but riding at such speeds is not recommended on this very popular trail, or on any multi-user trail. 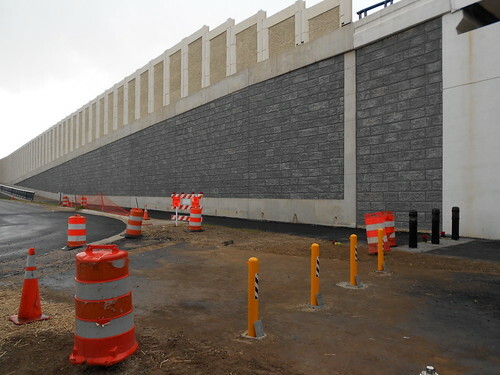 "In the MTA plan, a retaining wall or noise wall at least four feet tall would run along the properties that back up to what is now the Capital Crescent Trail, cutting off access from those yards. Access points would be limited to breaks in the walls. In Kaszubski’s neighborhood that would be at Sleaford Road and Kentbury Way." "April 13, 2011: A vote to repeal the Prevention and Public Health Fund: The fund is administered by the secretary of health and human services for various public health services. Republicans argue the “slush fund” would be used to support jungle gyms, bike paths and some lobbying activities." Also, the Post has a long article on what a success the Wilson Bridge Bike Path has been (in spite of the shortcomings that many have mentioned here - imagine it if it connected directly to South Capitol Street.) The whole thing is a good read. "Prince George’s officials said use of the 3.5-mile Wilson Bridge trail has increased dramatically since it opened in 2009. In March, the Maryland-National Capital Park and Planning Commission recorded 26,827 crossings, up from 13,998 in March 2012." "Right now, the Wilson Bridge trail provides a connection only to National Harbor on the Maryland side, but that could change soon. The county is renovating Oxon Hill Road, and, as part of the project, bike lanes will be added to the heavily trafficked county road, which connects residential communities to the Wilson Bridge." "In the past year alone, trail usage picked up by about 10 percent in the area where the bridge trail meets the Mount VernonTrail, the second-busiest location for bicycles and pedestrians in Alexandria,"
The long-awaited reconstruction of Oxon Hill Road will start this week, according to signs posted along the road by the Department of Public Works and Transportation (DPW&T) of Prince George's County. The $14 million project will add bike lanes to the 1.5-mile section of roadway extending from the Woodrow Wilson Bridge Trail south to Ft. Foote Road. A few traffic lights will be replaced with roundabouts. This project will have almost immedate benefits for some cyclists who wish to ride from the Wilson Bridge south to Fort Washington. 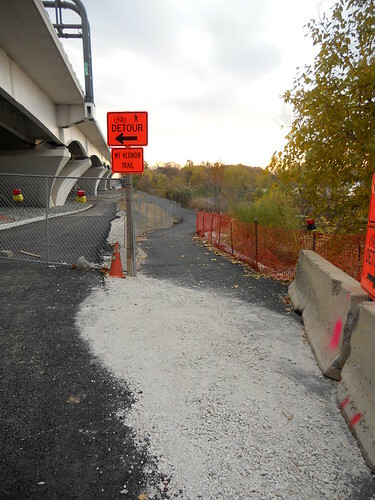 The worst section of roadway between the bridge and the fort for cyclists is the first mile on Oxon Hill road, which has 10-foot lanes, no shoulder, and drivers who often ignore the 3-foot rule when passing cyclists riding to the far right, and lay on the horn when cyclists use full lane. When I suggested adding "Bicycles May Use Full Lane" signs, the DPW&T safety director responded that they prefer that cyclists not ride Oxon Hill Road until the construction is complete. Nevertheless, the construction barriers will provide drivers (and hopefully cyclists) with the optical hint that bikes should use the full lane. The bicycle accommodations for Oxon Hill Road will not be perfect. The rotaries are being designed to encourage novice cyclists to ride onto a sidewalk and cross the streets as a pedestrian, but DPW&T has tentatively agreed to refrain from posting a sign stating that the bike route goes onto the sidewalk. There will be some door-zone bike lanes; but DPW&T is open to marking the hazard if the state will pay the cost for the extra striping (and the door-zone bike lanes account for less than half of the section of rebuilt road). As alluded to here, bicycle advocates met with transportation officials at the Wilson Bridge to discuss the bollardization of America (or at least the Wilson Bridge area). In short, it's too late to do much about it, but they'll add some paint and plastic bollards to further warn trail users. From that same tweet, it appears that WABA has talked to someone about allowing cyclists on the Navy Yard Promenade. Have you ever wanted to ride your bike for a living while making bike parking better for everyone? If so then this is the job for you. CaBi set a new record in June, with over 200,000 trips for the month. Through the first seven months of 2012, they're at 940,000 rides. In 2011, they had 1.2 million rides for the whole year. Meanwhile stations in Alexandria are so close to being installed that "you can touch it." Speaking of Alexandria, their BPAC is looking for volunteers to do bicycle counts next week. City Bikes is hosting a free bike repair clinic on July 4th. So the purpose of the bollards is not to keep cars off the trail, but to keep cars from getting under the bridge. Still why not - as the photographer Rootchopper points out - move the bollards to run along side the trail? Answer: It's probably more expensive. So on the off-chance that a terrorist would target the Wilson Bridge, and to save a little bit of money, this is what we get. I suspect that these bollards will cause more harm than they'll ever prevent. The photographer adds "Last week the detour on the Mount Vernon Trail at the Wilson Bridge went straight here. Today, it was a left hand turn. Good luck to anybody who tries to ride through the gravel transition. This contractor's detours are poorly designed and built." More than one quarter of the people who testified spoke up for trails at last week’s budget hearings of the Maryland National Capital Park and Planning Commission in Fort Washington. Most of these speakers mentioned trails as one of the things that the Commission needs to support. Two speakers focused entirely on trails. Representing WABA, I urged the Commission to fund a design study to extend the WB&A trail two miles to the west across US‑50 and the Capital Beltway. (See map). Extending the WB&A across US‑50 and the Capital Beltway would immediately improve the usefulness of the trail because the Beltway is often a serious barrier to mobility. It would also provide a route to the New Carrollton Metro. On the broader scale, extending the WB&A across the Beltway is a key step toward the eventual goal of a trail between the WB&A and the Anacostia River. We also strongly urge that bicycle and pedestrian access to National Harbor and the Woodrow Wilson Bridge be improved as rapidly as possible. Hundreds of thousands of people have used the new Wilson Bridge bicycle/pedestrian crossing since it opened two years ago, but the trail still basically dead-ends at Oxon Hill Road. Several workable ideas have been proposed to link the existing trail to the rest of Oxon Hill and neighborhoods to the south, and these need to be implemented. For example, the Peterson Companies, developer of National Harbor, is obligated to build a trail along Oxon Hill Road, but plans for this project remain in limbo. For most practical purposes, the the Wilson Bridge is the gateway to the Potomac Heritage Trail of southern Maryland. In written testimony, representing some of the trail users around Glenn Dale, I urged the Commission to retain two improvements to the Folly Branch Trail, which will eventually run from around the Seabrook MARC station to Upper Marlboro. First, the budget for this year included a short segment along Folly Branch that would connect the WB&A Trail to the Vista Gardens shopping center, by using the overflow culvert to get under MD-450. Several years ago, the neighborhood next to the shopping center blocked the segment of the Folly Branch Trail to the shopping center, and persuaded Councilman Hendershot to support them. You can see the trail bed next to a closed gate near Panera Bread. The new segment will go under MD-450 and then straight up that trail bed, while the main Folly Branch Trail will go on the East side of the swamp. The neighborhood of big houses on the other side of the swamp from Vista Gardens wanted a trail to the shopping center--it was just the townhouses near the shopping center that did not want the trail. Second, the budget for 2014-2015 has a trail from Glenn Dale across or around Folly Branch to the existing Folly Branch Trail parallel to Forbes from MD-450 almost to the Amtrak line. That will give Glenn Dale a trail to the Seabrook MARC station. A few people in Lincoln might find this a more direct route to Seabrook as well. Conversely, people in parts of Seabrook might prefer this way of getting to the WB&A. It will also create a terminal loop (until WB&A is extended) for people coming from Bowie on the WB&A along MD-450. (See map). 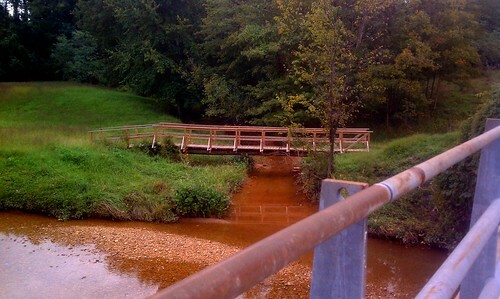 The wooden bridge in the photo below crosses a small stream that feeds into Oxon Run. 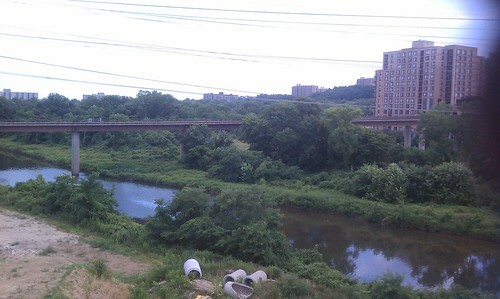 The last time I went out here (on the route from DC to the Wilson Bridge) it was a low water crossing. Maybe the title should be "Newish..." I remember blogging about this, I think, but I can't find the post. Froggie adds more on this at JDTP. He further points out that the detour here (which was not signed, so just had to know it) isn't very safe, but at least it's long. There are better times to do this - like 2am.